Todays stability tests revealed a weak layer 3 feet from the surface that was also found in the previous week's tests. This weakness is a result of a snow density change overlying a layer of slowly rounding surface hoar that developed in late December-early January. This layer required more force to generate fracture and propagation (ECTP29) and the surface hoar seems to be showing signs of rounding; thus, improving in stabilty. This layer is deep and not highly reactive at this point; however, failures on this slab are possible and likelihood would be increased by events such as the rapid warming experienced today (1/28) and the previous Friday (1/22). 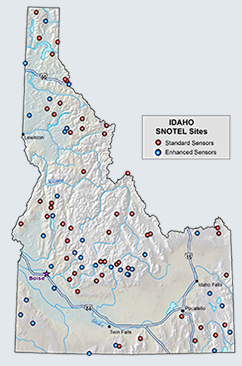 Other failures within the upper snowpack were found 17 inches below the surface. Again, these were weaknesses that were found in the previous week's outings, although this weakness failed with less force (ECTN17) it showed a low likelihood of propagation and only seems to be forming a cohesive slab layer where it is exposed to the effects of wind. BOTTOM LINE: Pay attention to weather and be cautious during any rapid warming event that may cause this layer to become more reactive or trigger cornice fall. A heavy impact such as a cornice breaking or a human jumping off a cornice on skis or snowmobile could generate the force neccesary to trigger this slab layer. The mountains of the Kootenai N.F. are currently recieving copious amounts of moisture today (1/28) that will likely continue through tommorow. This moisture is currently falling as rain below 5,000', above that level there is ample amounts of snow available for transport. Exposed ridgelines at the upper elevations are being exposed to winds out of the Southwest at 10-15 mph that are likely to generate additional loading and the formation of new wind slabs. This problem will likely be a bigger concern for those that may be venturing into the Eastern Cabinets where there is more exposed alpine terrain. BOTTOM LINE: Use caution on the leeward side of exposed ridgelines especially in the higher alpine areas of the Eastern Cabinet range. Warm temps and rain below 5,000' in elevation will likely cause some wet slides. Pay attention to potential terrain traps (terrain such as steep gullies and small depressions) where small slides could increase the consequences of a slide. Todays travels revealed some positve trends in the snowpack as compared to the previous week's stability tests and general travel observations. The most concerning avalanche problems within the snowpack at this point are improving in strength as the weak interfaces round and bond. The other primary concerns are the weather related issues of wind and temperature. New snow + wind will create a hazard at exposed ridgelines. Approach with caution and if you decide to get into these areas use good travel habits and minimize risks by crossing or riding one at a time. Temperatures will also create a potential hazard thru Friday and possibly Saturday at elevations below 6,000' , again manage your risk by choosing terrain wisely and practicing safe travel habits. ONE PERSON AT A TIME IN STEEP TERRAIN AND WATCH YOUR PARTNERS! Remember that avalanche safety means getting educated, getting the right gear and knowing how to use it effectively. These are also the requirements of being a good partner in the backcountry. There was a fatality in the Whitefish Range on January 23rd. The accident report can be found on the FAC home page. Our thoughts and condolences go out to the family and friends of those involved with this loss. The previous week's travels took me into the Eastern Cabinets on January 21st where I observed extensive cracking and wind slab activity below ridgelines. I returned to the same ridgeline on Sunday with some friends to find that some of those slabs had released naturally during the warm rainy weather that came in on Friday. Some fairly deep crown lines were observed further up in the basin as well as evidence of wet slide debris in the drainage bottoms. National Weather Service predictions are calling for more warm temperatures and moisture through Friday the 29th. After that the temperatures seem to slowly decline back down to the near freezing mark with daily pulses of snow in relatively small amounts. 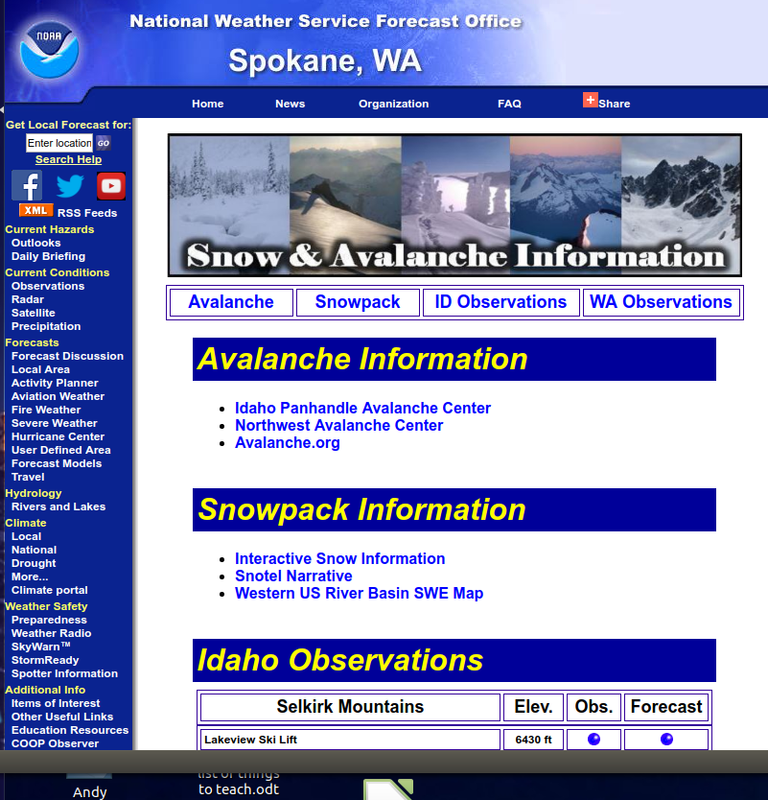 Declining temperatures should help strengthen our current snowpack at all elevations. There is some hinting of a larger system impacting the area by late next week and into the weekend. Stay tuned.